Ultrasonic ranging sensors are inexpensive, have no moving parts, have no lenses to clean, are normally small and unobtrusive, and can measure distances through moderate amounts of dust, smoke, and humidity, so they are well suited to underground mines. 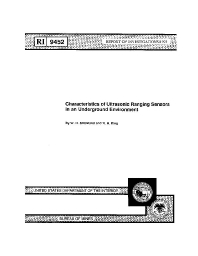 In the work reported here, conducted by the U.S. Bureau of Mines, researchers tested ultrasonic ranging sensors for their ability to define rib line features for computer-aided navigation of underground mine mobile equipment.The investigation began with laboratory tests of field of view, angle of incidence, intersensor variation, and ranging accuracy of the individual rangers in a ring array produced by Denning Robotics of Wilmington, MA. The results showed that the sensors have good accuracy and low variability. Additional experiments at AMAX's Henderson Mine showed the sensors could accurately and reliably measure the distance to mine features, including convex and concave corners and rib intersections. The results showed that when used properly, the ranger data are accurate enough for reliable mine vehicle navigation. When used incorrectly, ultrasonic rangers do not provide the anticipated data. Therefore, this report explains the principles of ultrasonic range measurement, describes the ranger's strengths and weaknesses, and explains proper ranger use and data analysis.